Richard Allen Taylor, Phebe Davidson, John Birkbeck, Anne Barnhill, S. Craig Renfroe, Jr., Heather Jane Collings. Carp Head Replica by Mark Hartenback, Delirium: Selected Poems by Lloyd Van Brunt, Keep and Give Away by Susan Meyers, In Mirrors by Lyn Lifshin, Re-Entry by Michael White, Thru The Heart of This Animal Life, A Measure of Impossible Humor by Chris Cunningham, Playback by Raymond Chandler, Ted Benoit, and Francois Ayroles, A Quiet Divide by Roger Colombik. Irene Blair Honeycutt, Anthony S. Abbott, Joan E. Bauer, Pam Bernard, Ann Campanella, David Chorlton, Robert Cooperman, Silvia Curbelo, Mary Christine Delea, donnarkevic, Cathryn Essinger, Rod Farmer, Jim Ferris, Janice Moore Fuller, Nathan Graziano, Maureen Ryan Griffin, Susan Lefler, Jay Griswold, Carol Hamilton, Jonathan Hayes, Fred Kirchner, Lyn Lifshin, Jennifer MacPherson, Don Mager, Louis McKee, Ron Moran, Matt Morris, Michael Murray, Bruce G. Nims, Robert Parham, Richard Peabody, Gail J. Peck, Diana Pinckney, S. Craig Renfroe, Jr., Pat Riviere-Seel, Jonathan Rice, Mike Schneider, Dana Sonnenschein, Caren Stuart, Jennifer K. Sweeney, Gilda Morina Syverson, Wendy Vardaman, Richard Vargas, Charles Harper Webb, Dede Wilson. 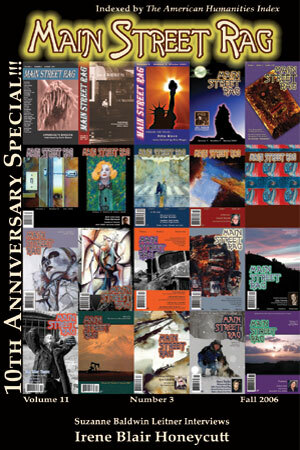 Cover Art: A collage of MSR covers by Doug South. Images by Vincent Calabrese, Gerald Wheeler.